As a motorcycle rider, to remain as safe as possible, it’s essential that effective rear observations are completed, without fail and when necessary. Effective rear observation will involve use or mirrors and looking round, over the shoulder check behind you – often referred to as the ‘life saver’ look. Rear observations should be completed before you signal, change direction or speed. You must know how your actions are going to affect other road users behind you. For other road users and your own safety, rear observation is essential for know what is coming up alongside you before changing direction. I have Mirrors, Why Do I Need to Look Behind? Whilst most modern road motorcycles have mirrors, a certain few do not. 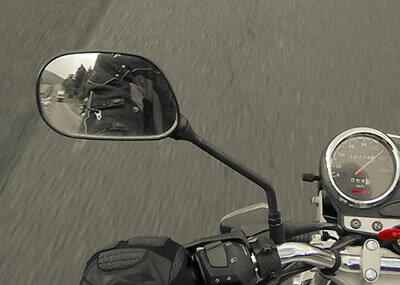 Even if your motorcycle comes complete with mirrors, you’ll still need to physically look behind as most mirrors do not cover all areas to the rear and sides. Areas that you cannot see in your mirrors are called blind spots and the total rear view that can be seen in mirrors varies from the type of mirrors used and the make and model of vehicle. An example could be that you intend on changing lanes and all appears to be clear in the mirrors. However, another motorcycle or a small car may be to your side, which may not be viewable in your mirrors. This vehicle would only be seen via a over the shoulder check. Indicators can be difficult to see on motorcycles. Bright sunshine and the fact that they’re close together can make them difficult to see for other road users. Another benefit of looking behind is that it provides another signal to road users that you intend on moving out. As previously mentioned, this is the blind spot area that cannot be seen directly behind you and directly to your sides that cannot be seen in the mirror. This is the final check you make before committing yourself to the manoeuvre. Urban areas will see a shoulder check being essential on most occasions before a lane change or change of direction, particularly turning right from a major to a minor road. A situation where it’s safer to concentrate on what’s going on in front of you is when riding at speed. If you are certain what is going on behind you and you intend on overtaking at high speed, avoid a shoulder check. Anticipation and planing whilst riding ensures that looking behind is performed when necessary and safe. Use your own judgement on when to look behind, but remember that looking behind means you’re not looking ahead. If you’re riding close to vehicles in front or riding at speed, it may prove more hazardous to avert your eyes from the front. Equally, looking behind too often, unnecessarily or at the wrong time is likely to prove hazardous.